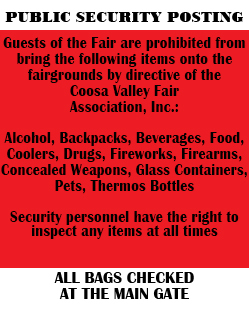 Thursday is KIDS & SENIORS DAY at the Coosa Valley Fair – an opportunity for local students, kids groups, senior citizens and senior groups to enjoy Fall’s Finest Festival with free admission from 1 pm to 5 pm. Ride Ticket and Armband pricing still applies. We will also have our special time of games, prizes, entertainment for our Senior Citizens- and a much-loved beauty pageant, all taking place in the Special Events Building! Thursday, Oct. 4, 2018 KIDS & SENIORS DAY!! !